Tagline: When a girl has a heart of stone, there’s only one way to melt it. Just add ice. 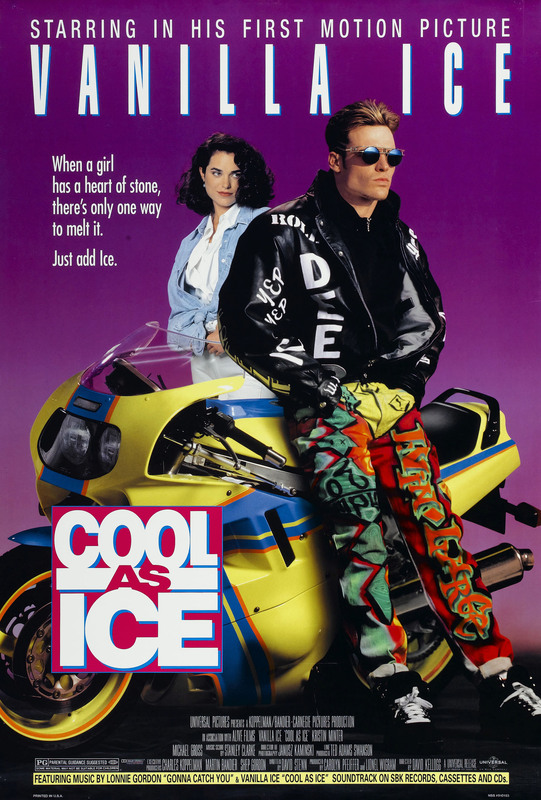 For a very brief period during the early ’90s, I longed to be Vanilla Ice. I remember turning up to school discos wearing ridiculous baggy pants and brightly-coloured sweatshirts, doing my utmost to imitate his bodacious dance moves while wondering just how he got his hair to stay like that. Sometimes I would dream of bursting into the school hall and wowing the ladies with my hip moves and colourful charisma. It’s amazing what a classic Queen riff and a well-oiled corporate think tank can do to an impressionable young mind. Not satisfied with a multi-platinum selling single, the Universal vultures would send their million-dollar treacle machine to Hollywood, plaguing us with what is essentially a remake of Marlon Brando’s 1953 Drama The Wild One – if you were to blend the style of that film with the colourfully shallow MTV dance video’s of the early 90s. But let me make one thing clear to you, Vanilla is no Brando, and the pop star’s ‘rebel’ is most certainly without a cause. The Hell’s Angels underwent a serious makeover in the early 90’s. Backed by three largely peripheral African American homies, our phoney gangsta cruises through a small suburban town oozing vicarious street cred, until one of his gang runs into some automotive trouble and is forced to make a pit stop at a local garage. There we meet excruciating middle-aged couple Mae and Roscoe, the movie’s answer to Peewee Herman, and by the time they have contrived to dismantle the bike they were asked to fix ― a wacky plot device designed to paint the gang as family-friendly ― you’re kind of wishing they had brought their Uzi 9mms along for the ride. Of course, many records have to be sold to many children, and so the gang decide to stick around and practice their dance moves, taking part in a series of dazzlingly empty scenes which drag interminably as Vanilla sits around stroking his chin and offering cardboard introspection to anyone dumb enough to buy into it. Luckily for him, the garage happens to be situated across the street from pretty suburbanite Kathy, a talented horse lover who just needs to learn how to loosen up a little, and boy is she in luck! I use this picture of Roscoe for target practice – and boy does it feel good! The only thing standing in Vanilla’s way is the newly christened Kat’s preppy boyfriend, Nick, a buttoned-down douchebag with an amiable facade who immediately offers the movie’s resident rapper the kind of casual scorn he so richly deserves. Unperturbed by the fact that he almost killed Kathy with his bike while attempting to woo her, our fraudulent rapper ‘accidentally’ runs into the couple at a local dance hall, where he and his gang clear the stage and show the repressed townsfolk what it means to truly live with a little body popping. Immediately won over by the outsider’s streetwise bravado and two-bit mic skills, the formerly unimpressed Kathy soon softens into the proverbial putty, and Nick is understandably aggrieved when his girl begins grinding with the faux-macho dipshit who rode into town, bamboozled when she rejects his offer of forgiveness in favour of an MTV-style montage which threatens to oust him for good. Once Vanilla has revealed his deepest philosophies and hairless pigeon chest, that threat is realised irrevocably, but when his backstabbing harlot appears on television to receive a showjumping honour, our introspective hero is not the only one taking note, and soon Kat’s entire family are under threat from a gang of bumbling mafioso who have some unfinished business with her surreptitious father. Predictably, the head of the household mistakes the floppy haired rebel for one of their pursuers, but when Kat’s wetbag of a brother is kidnapped they immediately turn to the bloke in the baggy neon pants, whose supersleuth contrivances lead him to the same construction site where he and Kat shared their very first date. Yo! I’m new to the neighbourhood. Could I possibly trouble you for a cup of sugar? Sporting a pair of Gaultier shades and a gold earring, the leather-clad Johnny employs the help of his hip-hop brethren and inevitably sets out on a mission to earn the respect of his beau’s protective parents, utilising his precocious rap-style wisdom and corporate repertoire with agonisingly formulaic consequences. As you can probably imagine, their romance only blossoms from there. Looking to sabotage Kathy’s relationship with boyfriend Nick, Johnny offers her some words of advice. The interminable slapstick scenes with Roscoe and Mae not withstanding, this is cult status bad movie fare. With bad hair, bad raps and Vanilla’s unprecedented gift for chin-stroking, this MTV-styled oddity is one for the corporate pop culture time capsule. Murderous rap producer Suge Knight once hung the eyebrow-raising cash cow from an apartment building balcony, and who am I to argue? I am a reviewer of bad movies, that’s who! And this is one of the very worst.